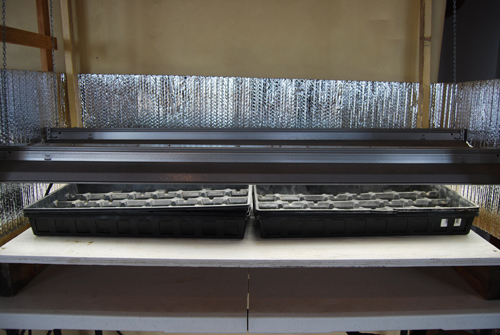 You can buy light boxes to start your seedlings in or you can make it. This is nothing fancy but works like a charm. Here is my simple light box I built myself with some scrap lumber I had around the house. It will fit between 2-4 big trays under the lights. See pictures for details of construction. I had already built them (I have two) or I would have done a step by step but I think you’ll be able to follow. 1. 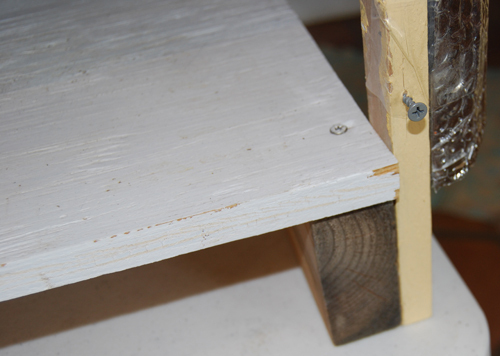 BASE: I use plywood – 2′ x4′ by 1/2 inch thick piece for the base of the box that I attach with screws to 2″ x 4″x 2′ on the short sides (depth). The base is now done. 2. 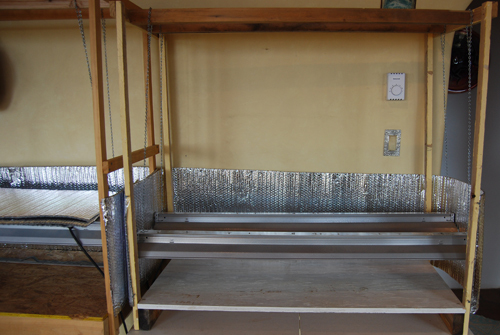 TALL VERTICAL SIDES: I attached 1″ x 2″ x 45″ pieces to each corner with screws. I connect with screws on the short sides (depth) another piece of 1″ x 2″ x 2′ to hold them together. 3. 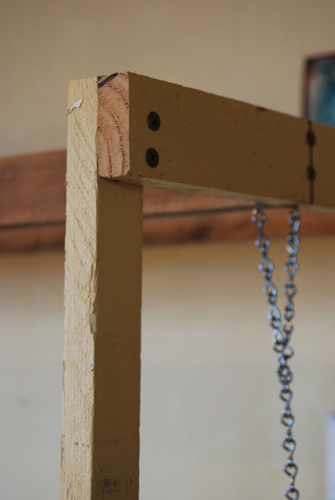 CROSSPIECES LENGTHWISE: To connect the top pieces for stability and to also hang the lights, I attach (2) 2″ x 2″ x 4′ across the width. I screwed them in from the outside. They are set 6″ in from the front and back so the lights can hang and not touch each other. 4. 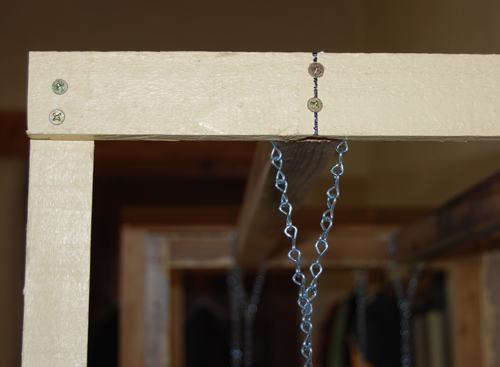 CHAIN TO HANG SHOP LIGHTS: I buy around 40″ on light chain and get some hooks to go into the light slots to hang the lights. Each light will have 2 chains. 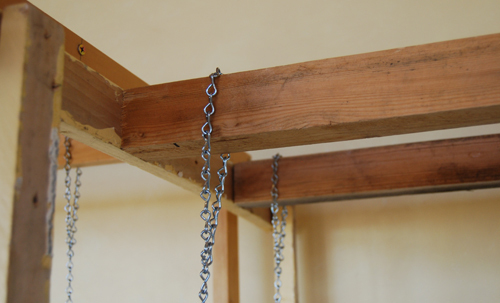 The chains can be raised as the plants get taller. 4. 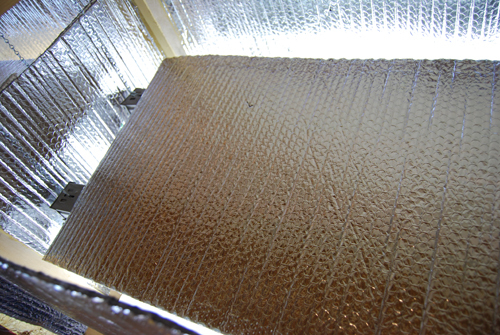 FOIL INSULATION: I buy a roll of foil insulation (looks like foil bubble wrap) from Home Depot or Lowes to wrap the outside of the light box on three sides. I attach it with wrapping tape to the corners. I left the front piece separate so I can take it on and off. Notice the screws in the front of the wood so I can hang the front piece of insulation off them. I made some holes in the foil (I reinforced the area where the holes will be with more packing tape so the holes won’t stretch too much). Here it is with the front piece on. I leave this on all the time as it makes it warmer except if I need to get to the plants for watering. 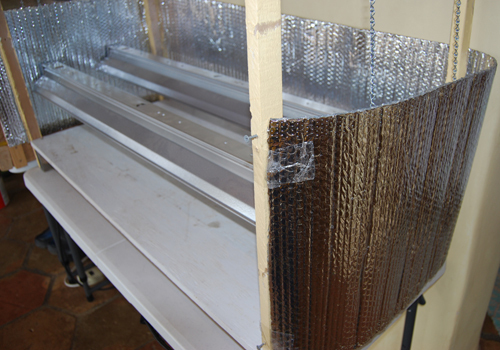 I also like the reflection of light from the insulation when the lights are on providing more light to the plants. I also have an extra piece to put on top of the lights at night. I keep my house pretty cool at night (64°F) and find having a top keeps some of the heat in. I don’t put the top piece of insulation on top of the lights until I turn off the lights at night and I take it off in the morning when the lights go back on. Here it is ready to start seeds inside. 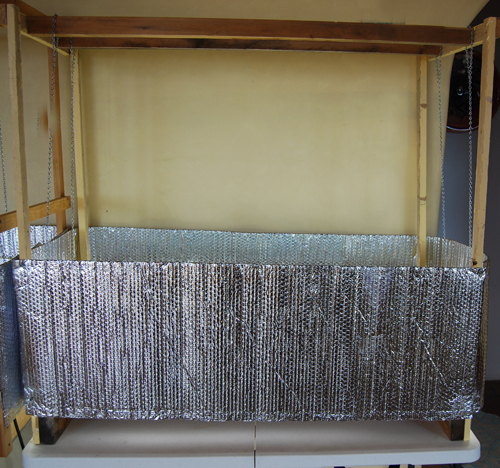 This entry was posted in Building a light box, GARDENING TIPS, general, starting seeds tips, TOMATOES, tomatoes growing tips and tagged building a light box, gro box, planting seeds inside, starting tomatoes. ← Spring Equinox-First day of Spring in Santa Fe-69°F Today!